F or Iowa feeder Harris Hay- wood, waking up to blizzard conditions creates concern, but not the worry he’d have if his cattle were in an open-lot facility. Instead, he feeds cattle in nine monoslope facilities at and near his farm in Eldora, Iowa. By dropping the curtains on the barn, he keeps the cattle dry and sheltered from extreme weather. Haywood built his first 40' deep monoslope facility, which houses 450 head, in 2001. Now he feeds cattle in nine of these facilities. A typical monoslope building has a roof truss that is higher on the front side, which faces the south, and slopes toward the back. There are no permanent front or back walls, but rather curtains along the open sides that can be lowered during weather extremes. Most of the time, however, the facility remains open to allow for air circulation and ventilation. 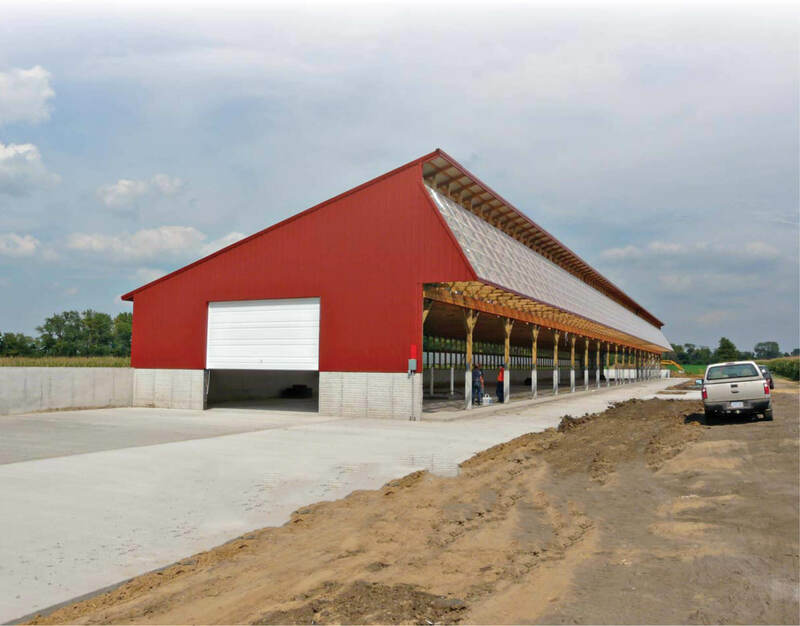 The rule of thumb when determining the necessary length of a single-wide, 40' barn is one head per foot of length. Some facilities are twice as wide, but still have the monoslope roofline. In addition, facilities of this type require a bedding pack, which usually consists of harvested cornstalks, bean stubble, wheat straw or sawdust. This type of facility is relatively new for feeding cattle, so there’s not much definitive research on animal performance and other factors. Beth Doran, Iowa State University beef specialist, says she helped conduct an informal survey of 29 producers across Iowa who fed cattle in either a hoop or monoslope barn. Of those surveyed, 15 used monoslope facilities and 14 fed in hoop barns. 50% reported no change in feed intake. 43% reported an increase in feed intake. 86% reported improved average daily gain and improved feed efficiency. “When you have corn at $3.50 or more per bushel, and you can save 10 bu. to 12 bu. per animal, that adds up,” an Iowa feeder says. Biggest benefit. Manure nutrient value is higher in the monoslope buildings compared to the manure in outside yards. At current fertilizer prices, the annual manure value from these facilities is greater than the building payment, points out Daryl Eichelberger, who has two 450-head buildings near Muscatine, Iowa. He says the manure nutrient value stays very consistent coming out of the barn. Using that dry manure has eliminated the need for commercial fertilizers on his family’s 1,000-acre corn and soybean farm. He says one facility produces enough manure for him to cover 400 to 450 acres. The improvement in manure value is due in part to the covered facility’s ability to keep rainwater from washing manure away and diluting it. There is no runoff from these confinement facilities, and in Iowa, that’s critical to meet state Department of Natural Resources permit requirements. 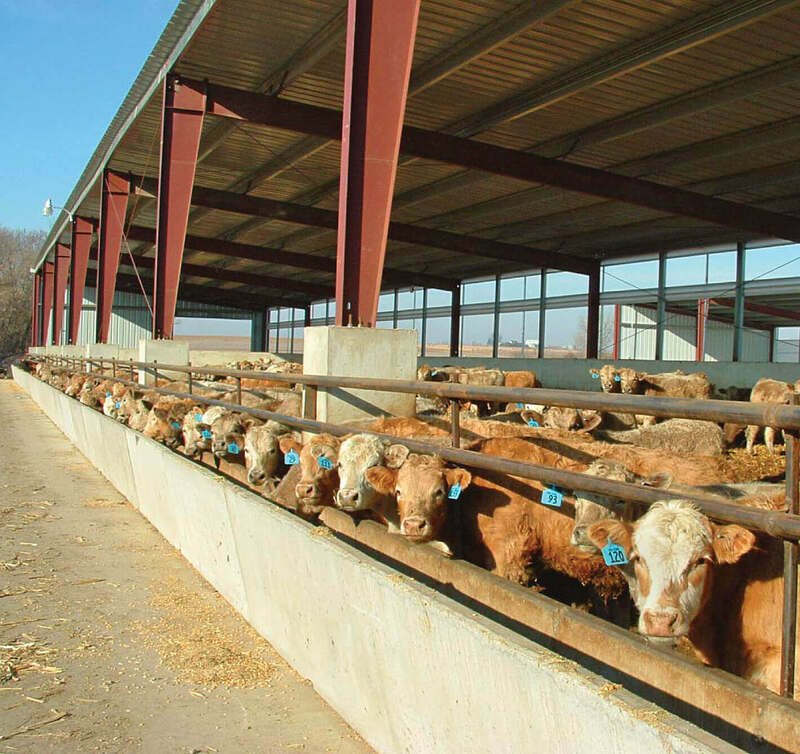 Producers who feed cattle in monoslope barns report increased feed efficiency and gains. Some even say carcass quality is better for animals coming from these facilities. Haywood attributes part of that to cattle not having to burn as many calories trudging through muddy pens or heating up in the summer sun. He says he hasn’t seen much difference in rate of gain, but definitely sees an improvement in the amount of feed needed for that gain. “When you have corn at $3.50 or more per bushel, and you can save 10 bu. to 12 bu. per animal, that adds up,” he says. In addition to improved performance, Haywood and Eichelberger say, the barns make it easier to monitor cattle health. The amount of labor required to clean pens is actually less compared to open lots because dry manure in the barn isn’t as hard-packed as manure in an open lot. Facilities have a deep-packed bedding, usually consisting of corn stalks, for example, and it is changed out every four to five weeks during the winter. In the summer, Haywood says, bedding material doesn’t require as much changing. The cost to build a monoslope facility is around $550 to $650 per head. That’s a hindrance to many, but there are USDA programs that can help offset the cost. Eichelberger says his farm received Environmental Quality Incentives Program (EQIP) money to close all its open lots to prevent runoff. Even without those programs, Haywood sees the payoff from the barn in improved cattle performance and increased manure value. “The biggest drawback is the price of the barns, which can take 12 years to pay back,” Haywood says. He feeds cattle in nine monoslope barns, but does not own all of them. He owns three barns, while the other six were built by neighbors who wanted to use the manure on their farms. Bonus Content: Find this story under the Current Issue section at www.beeftoday.com to access more information about monoslope cattle facilities. BEEFTODAY.COM PHOTO: JEFF PASTOOR Producers who feed cattle in monoslope barns report increased feed effi ciency and gains.